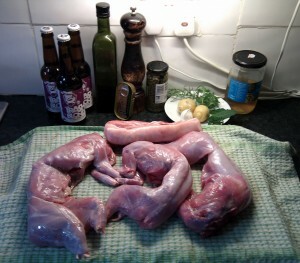 It was to be rabbit stew for dinner this evening, having picked 3 bunnies up from the butcher in the Hitchin markets. We’re having to try out new butchers at the moment – alas there aren’t many around and I’m not so keen on what I can find. Sadly the best butcher in Hitchin, Mr Foskett, shut up shop for semi-retirement. I’m thinking of buying a car just so I can get to a decent butcher again … desperate times. Anyway, I digress. Flicking through my Clarissa Dickson-Wright Game Cookbook I felt inspired to bring bunnies and beer together by a recipe for Rabbit Saltimbocca braised in Heather Ale. I wasn’t interested in saltimbocca though, so have instead loosely based this recipe on Clarissa’s Rabbit Stew recipe on the previous page. Having recently received an order from BrewDog I had a few beers to choose from and settled on the Trashy Blonde (ABV 4.1%; OG: 1.0417; IBU: 40; Hops: Amarillo, Simcoe, Motueka) as it wasn’t too bitter for stewing with (I’ve had some beer based stews come out way too bitter in the past.) The recipe uses salt-preserved lemons as I thought the wonderful lemony hint they add to the flavour would compliment the beer-based gravy, I believe it worked quite well. The pork belly is optional (well, everything in any recipe is optional – in this case I just think the pork is extra-optional.) If using the pork belly then the first thing to to is put a tablespoon of olive oil into your stew pot and heat it, then thoroughly brown the pork. Remove the pork and put it in a bowl to the side. Now add another tablespoon of oil and brown the bunny bits in batches. Just put in enough at a time to fit on the bottom of the pot without them touching. Once browned on both sides remove the bits to the bowl with the pork and repeat until all the bunny is browned. 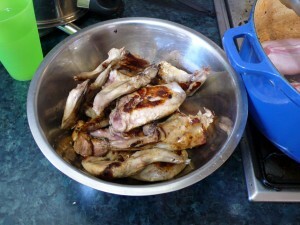 All of this “browning” should be done on quite high heat – there will be smoke and black build-up in your pot. Do not be scared, this is all good. Next toss the shallots into the pot and give them a good browning as well. Put them aside also. Turn the flame under your pot down low and add the rest of the oil to the pot and then the garlic. Sizzle this very briefly (don’t let it brown, sizzle for mere seconds! Only because I like the smell.) Now pour in the Trashy Blonde! Whooosh! Steamy fun. Using a wooden spoon or scraper give the base of the pot a good scraping to pick up all the tasty residue. Scrunch up the fresh herbs a bit and throw them in. Then throw the rest of the ingredients in: preserved lemons, capers, stock (if using), anchovies, and black pepper. Set this simmer for a minute then add the meat and shallots back into the pot. Top this up with hot water or light stock until the meat is just barely covered. Bring to simmering point and then pop it in the oven for 1 hour. Roast Parsnips & Carrots: Bring the oven up to 250C. Peel the parsnips and carrots and chop them into 2 or 3 large chunks. Lightly coat with oil and put them in a baking tray. Sprinkle with sea-salt and black pepper then pop into the oven. Cook until – well, cooked. Potatoes: Do this after putting the other veggies into the oven. Using a slotted spoon, or similar, remove all the meat and other bits from the stew to a bowl. Cover and set aside. Bring the stew gravy to simmering point and then add the sliced potato. Simmer until the potato is cooked to your liking. When the potatoes are cooked add the meat back to the pot and let simmer a little more to warm before serving if necessary. Bread: The thin and tasty gravy you get with this recipe makes this a perfect stew to have a bit of bread with. I get a good sourdough from our local baker. Whatever bread you use please let it be something robust, not the modern fluff you get in the supermarkets. A good traditional bread with a firm texture will take up the stew juices beautifully, the modern junk will just turn to slime. Serve with a bottle of Trashy Blonde, of course! 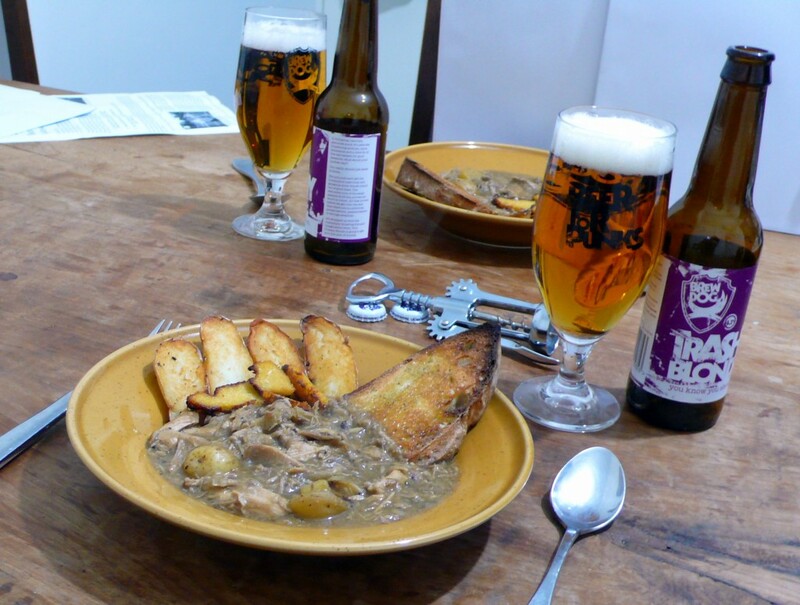 This entry was posted in Cooking, Recipe and tagged BrewDog, Bunny, Rabbit, Stew, Trashy Blond by Yvan Seth. Bookmark the permalink.